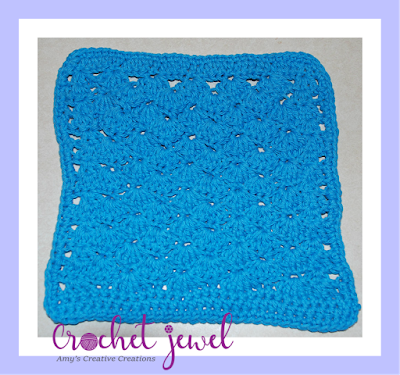 This shell design crochet dishcloth pattern is perfect for the kitchen! Row 1. work a dc in the 2nd chain from the hook and each stitch across, (34 dc) turn. Row 2. chain 3, work 3dc in the next stitch, *skip 4 stitches, work 5dc(shell made) in the next stitch, *Repeat, the last skip 4, work 3dc in the next stitch, skip next stitch, work a dc in the last stitch, turn. Row 3. chain 3, in the 2nd dc, work 3dc, *sc in the 3rd dc of the shell, work 5dc in the next chain space between the two shells, *Repeat, at the end, work 3dc in the 2nd dc space of the previous 3dc, dc in the last chain space, turn. Row 4. chain 3, work 3dc in the 2nd dc of previous 3dc, *work 5dc in the sc space of the previous shell, sc in the 3rd dc of the previous shell, *Repeat, at the end work 3dc in the 2nd dc space of the previous 3dc, dc in the last chain space, turn. Rows 5-16. Repeat Rnd 4. Row 17. sc in each stitch across, turn. Row 18. hdc (half double crochet) in each stitch across, slip stitch. Row 19. sc in each around the entire dishcloth, sl st, fasten off, finished. Hi. it's me again. Rnd 2. Last 4 stitches. I have re-done Rnd 2 4 times and I still keep coming up with 6 stitches at the end. I tried crocheting into the turning change, frogged it and tried the next stitch (as the pattern stated) and I still keep coming up with too many stitches left over at the end of Rnd 4. I also counted to make sure i had 33 DBL crochets on 1st row and my count is correct. I can't for the life of me figure out what I am doing wrong. It's not like I'm new at this. I've been crocheting for 45 yrs.